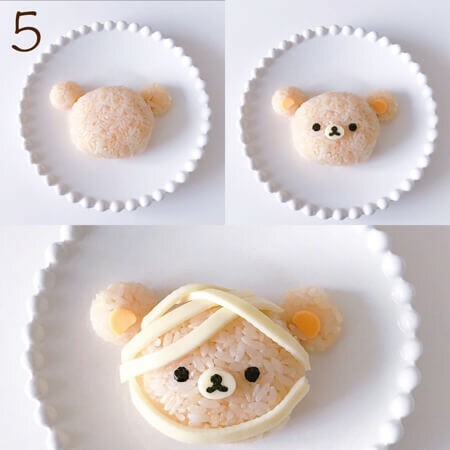 2: Make Rillakuma-colored rice (90g) by adding and mixing mentsuyu with the cooked rice. Mix it in well so all the rice is the same color. 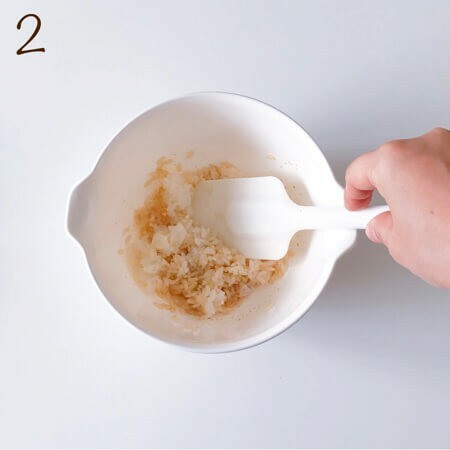 Separate the rice into two groups, one to make the face (80g) , and the other to make the ears (5g). 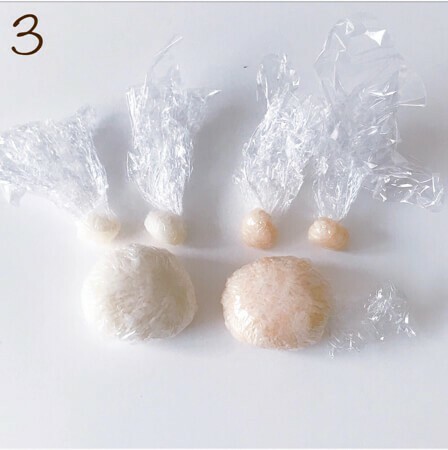 Use saran wrap to form the rice into the correct shape. Cut the slice cheese (5mm) and roll it at an angle on the sausage. 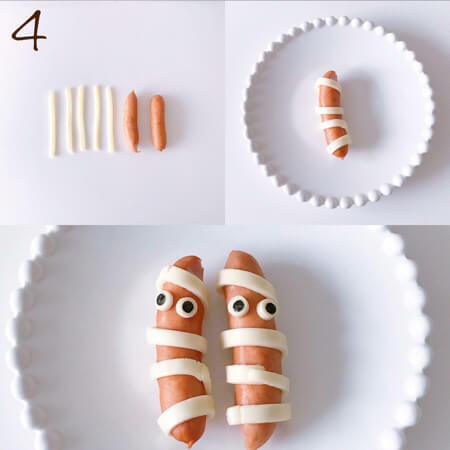 When you roll the cheese, melt the cheese with your hand’s heat and attach to the sausage so that the cheese will look like the bandage of a mummy. Place the cheese cut in a circle on top of the blank space and place the seaweed on top of the circular cheese. This will become the eyes. 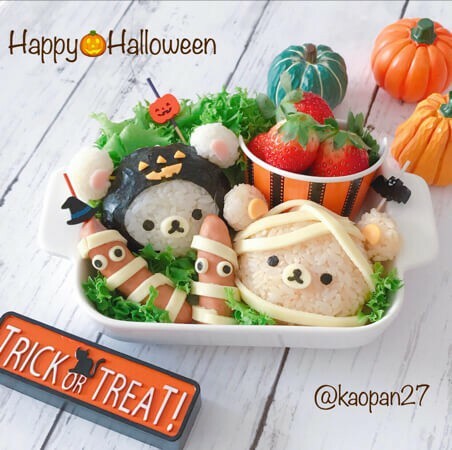 5: Fix the ears using fried pasta (refer to “Purin Chan no Milk Pudding”). Attach the cheese to the mouth and ears and make the eyes and mouth by using the seaweed. 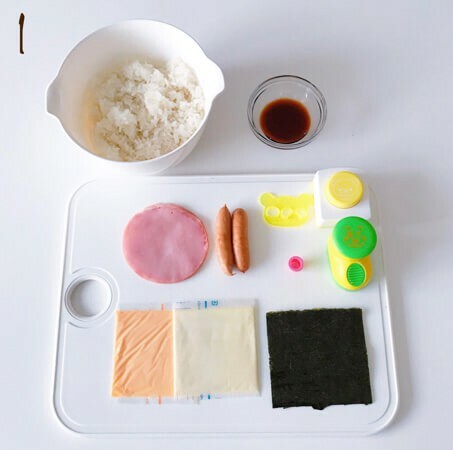 As in step 4, complete Rilakkuma by using the slice cheese and placing the parts so everything is balanced. Cut the seaweed like in the photo. If the seaweed sticks up hold it down and into place by using some saran wrap. After attaching the seaweed, fix the ears using fried pasta. 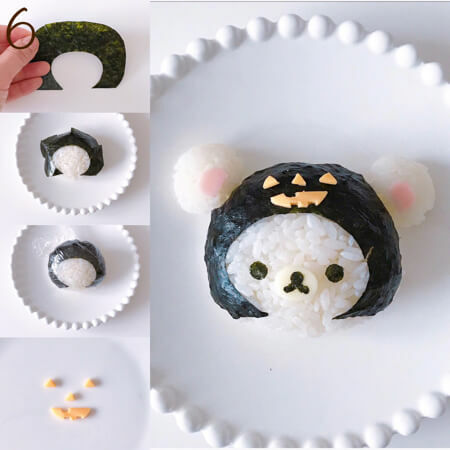 In the same way as you did for Rilakkuma, make the eyes and mouth with seaweed and ears with sliced ham. Use a toothpick to cut the slice of cheddar cheese. This will for the head parts of the pumpkin. Now, place this on top of the hat. Voila! It is now complete. The combination of mentsuyu rice and cheese is fantastic, isn’t it? 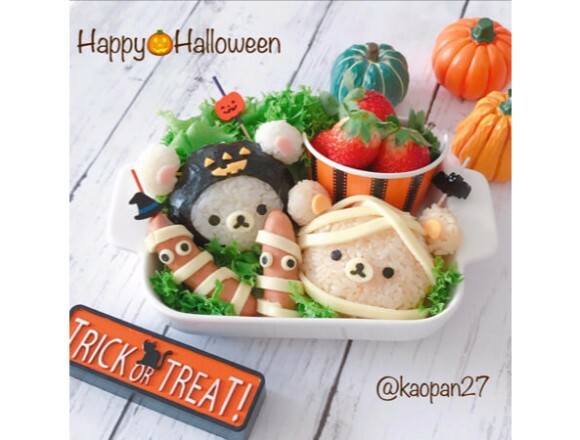 This is a great recipe to use at a Halloween party or a Halloween bento box.